A large northeastern state bordered by the Atlantic Ocean and the Lake Erie. The Native Indians of Pennsylvania included the Delaware, Iroquois, Shawnee, Susquehannock and Eriez tribes. The first Europeans were the Dutch arriving about 1631 setting up the Zwaanendael Colony on the Del Mar Va peninsula. In 1638 New Sweden was established and Sweden controlled the lower Delaware River region, which has parts of present-day Delaware, New Jersey and Pennsylvania. However, Sweden had only a few colonists there, including some from Finland. By 1660s, New Netherland under the Dutch held claim to several regions along the northeast, including Pennsylvania. By October 1664, the British defeated the Dutch, taking all of New Netherland. Between 1667 and 1674, the English and Dutch battled over the American lands. In 1681, England’s King Charles II granted William Penn a large tract of land, in what would become Pennsylvania. This was one of the largest land grants to an individual in history. It was called Pennsylvania, meaning “Penn’s Woods,” in honor of Admiral Penn, who was William Penn’s father. William wanted this new area of settlement to be in the form of a county commission and offer religious freedom, a major factor in studying Pennsylvania genealogy. The English Quakers came in large numbers for that reason. William Penn and the colonists who settled Pennsylvania were at first tolerant of slavery, but Quakers and German immigrants were among the first to speak out against it. High tariffs in the 18th century discouraged the importation of additional slaves, and encouraged the use of white indentured servants. By 1780 and through to 1847, slaves were gradually given their freedom. As European expansion continued into the 1700s, the Indian tribes were driven off or reduced to remnants. Besides English settlers, there were groups from Wales living near the area of Philadelphia. Also, because of the religious tolerance, many Germans and Scots-Irish came to Pennsylvania in the early 1700s. By the time of the 1770s and the American Revolutionary War, citizens of Pennsylvania supported the break with England. In December 1787, Pennsylvania became the second state to ratify the new U. S. Constitution. To reward the Pennsylvanian soldiers and to develop the western portion of the state, land grants were given to the veterans of the Revolutionary War. Industrial factories developed in the eastern portion of Pennsylvania in the early 1800s. The central and western sections were mainly agricultural areas, especially consisting of small farms. The large religious group of Amish in the central and southern end of Pennsylvania have maintained the old traditional ways of farming and living, including no use of electric. The term ‘Pennsylvania Dutch’ refers to the German immigrates. The word ‘Deutsch’ means German. In 1860 there were approximately 57,000 African-Americans in Pennsylvania. None were held as slaves. The American Civil War was fought in several locations along the southern border of Pennsylvania. The turning point was the Battle of Gettysburg in Pennsylvania during July 1, 2 and 3, 1863. Looking at Pennsylvania genealogy in the late 1800s, many immigrants from European arrived and settled in Pennsylvania and New York. Many of the poor immigrants took jobs in factories, steel mills, and coal mines throughout the state. In the 1980s, new immigrants, especially from Asia and Latin America, were arriving in Pennsylvania. Also, newer opportunities were developing that of healthcare, retail, transportation and tourism which are now some of the state’s biggest industries. With Pennsylvania’s population in 2009 around 12.7 million, over 25 percent are of German descent. The Irish represent 16 percent and Italians are 11 percent. There are still about 19,000 Native Indians living in Pennsylvania. 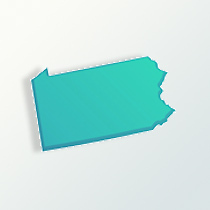 Various enclaves of ethnic groups are scattered across Pennsylvania, including people from Russia, India, the former Soviet Union, Korea and Poland. About 11 percent of the state’s population are African-Americans and 3.5 percent are Hispanic, with most living around the Philadelphia area. The Quakers started much of colonial Pennsylvania, but very few exist in the state today.